The landscape in this painting by Giovanni Bellini (c. 1430-1516) draws one’s eye first. Geometrically composed into three sections, each contrasting with the others, it begins with a cliff, formed of strangely blue-gray rock, spilling from upper right into the foreground, seemingly inhospitable to life. Yet in the crevices of this volcanic stone, finely detailed plants grow. The watering jug beside the walled flowerbed with its medicinal plants and the marble waterspout at lower left suggest a harmony in this place between its divine creator and those he has made. Just beneath the spout a tiny kingfisher perches atop the dead branch which holds the artist’s signature (see below). The bird’s symbolic association with the Resurrection stems from medieval observation that annually kingfishers shed their blood-red feathers. 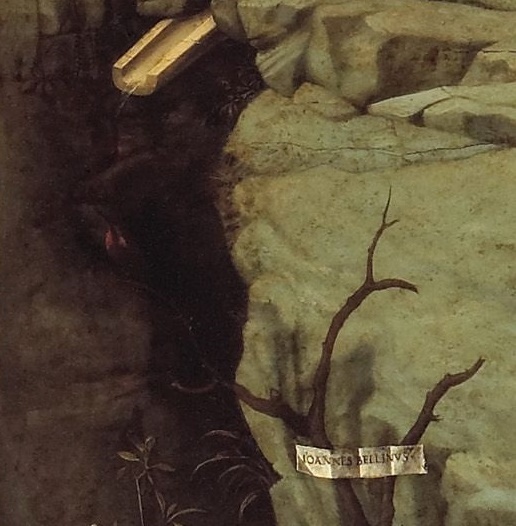 From a cleft in the rock a rabbit peers out in timid, twinkling curiosity, recalling the Desert Father St. Jerome (c. 347-419) who called Moses “the little rabbit of the Lord” (as Exodus 33:22 explains). Directly above, an olive sapling grows from a knotted graft atop a new trunk – the Stem of Jesse cited in Isaiah 11:1 – sprouting from a stump on a stony plinth: a subtle proclamation that the faith of each and every Christian depends on Jewish roots. Beyond the rocks an equally meek donkey stands in a pasture – a recollection that just such a pack animal breathed warmly over the newborn Jesus and days later carried him, a Jewish refugee, into Egypt, and that another donkey also carried him into Jerusalem, days before his death. Near the donkey an oversized grey heron perches awkwardly on the edge of a sandstone cliff. Venetians thought the bird wise and useful, capable of suddenly devouring eels and snakes. 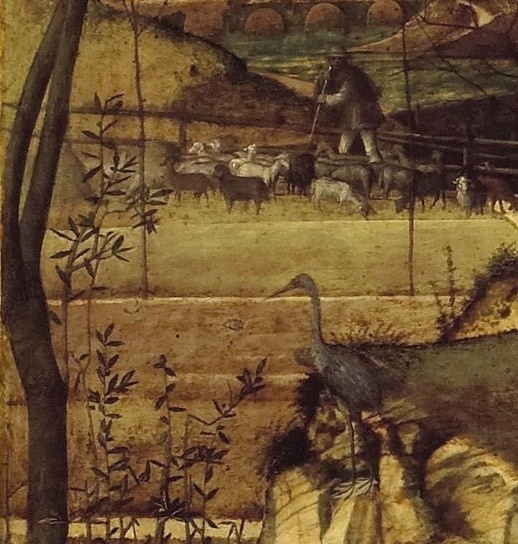 Above the heron a lone shepherd leans on his staff, surrounded by his sheep, and stares directly at each of us who look at him. At the bottom of the picture, paying no attention whatsoever to this lively landscape, a man stands with an expression once described as “no longer gentle, submissive, all-enduring, but strenuous in piety, powerful in appeal, almost militant in attack” (Claude Phillips, first Keeper of the Wallace Collection, London). This is St. Francis (c. 1181 – 1226) in a posture which echoes the shape of the cliff behind him. On each of his hands appear understated stigmata – tangible expressions of his intense personal identification with the wounds of Christ. But this scene is evidently not a depiction of the formation of these signs; both the usual six-winged seraph representing the crucified Christ and Brother Leo (Francis’s nearby companion) are missing, and Francis lacks the typical piercing of his chest. The saint steps forward in humility and in confidence. He prays with hands and eyes wide open, expressing both joyous rapture and animated awe, as if to begin his famous Canticle. We learn from his hermitage something of his life. It is a refuge within a community, not an exile from it (see the doorbell, rung by a delicate, knotted string). His wooden clogs (zoccoli) left at the entrance to his cell identify him with the Zoccolanti (or Observant Friars) and recall the story of Moses and the Burning Bush. The crucifix and crown of thorns substitute metaphorically for the seraph depicted in stigmatization scenes, while the skull and breviary are another homage to Jerome. That the first and last of these four artifacts are ordinary – even expected – in friars’ everyday lives suggests an attainable quality to the sanctification Francis finds. The horizontal struts of the desk (constructed like an artist’s easel) and of its naturally shaded bench anchor a series of orthogonal lines which show that Bellini employed a system of linear perspective originated in 1435 by Leon Battista Alberti (1404-1472). These orthogonal lines converge, not at a conventional central perspectival vanishing point, but at one just to the left of the panel – exactly in line with Francis’ astonished, transfixed gaze. What does he see? Bellini deliberately withholds the answer. But he gives us a clue: the laurel tree – associated with eternal life – whose lower leaves appear more brightly lit than its upper leaves, and whose boughs bend before the force of a mighty wind which touches just this plant. It is a divine light, God breaking powerfully into our world, the supernatural known in and through nature. The painter doesn’t tell us how the supernatural acts, but he tells us that it acts. What is important is the presence, not the mechanics. Bellini’s Francis is an Everyman, a bold witness testifying to God’s persistent activity in the world he has made. The saint’s stewardship and evangelism each derive from his vision, as expressions of his thankful embrace of all of God’s prodigally generous creation. In recognizing the divine light and in responding vigorously to it, Francis offers the quiet hope that this same power will shape our own lives. “A single sunbeam is enough to drive away many shadows,” he is supposed once to have said. As that single sunbeam shines into the heart of the saint himself, Francis invites us too into his ecstatic, active vision, and proclaims that all who seek meaning, reconciliation and peace in and with the world around them may find these elusive gifts in the savior whose wounds Francis bears, and in whose joy he delights. 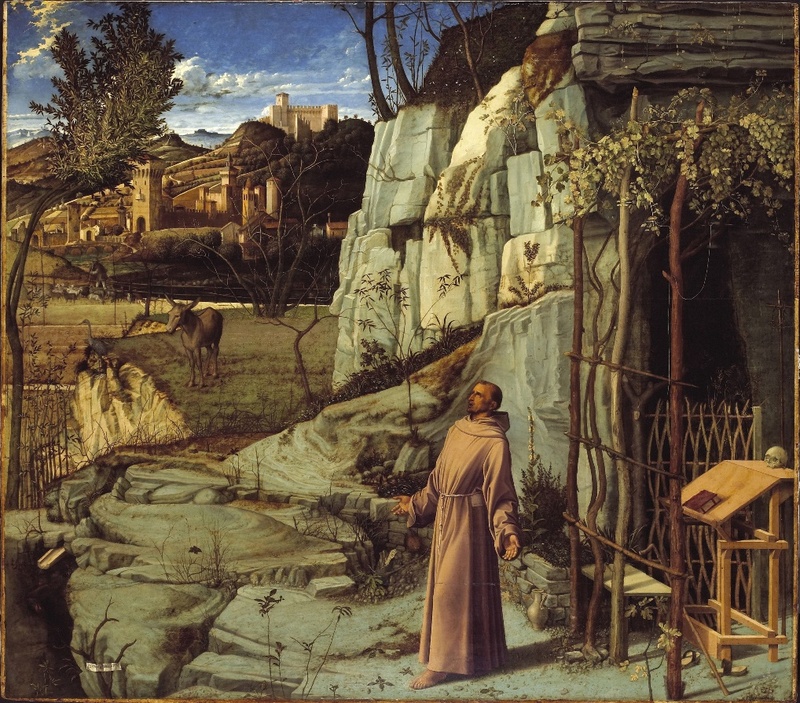 Giovanni Bellini: St. Francis in the Desert, about 1476-1478, oil on poplar panel, 124.6 x 142 cm. The Frick Collection, New York, USA. Bellini appears to have created this work for Zuan Michiel (c. 1440-1513), a notably learned civil servant and distinguished neighbor who, like Bellini, belonged to a lay confraternity steeped in Franciscan thought, the Scuola Grande di San Marco. 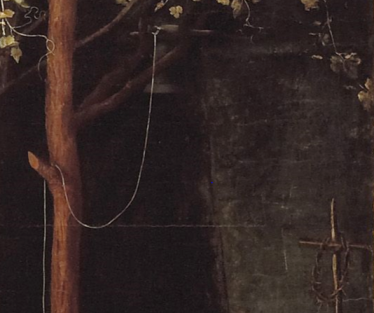 Michiel likely commissioned the work for his home, rather than for a consecrated setting such as a church, and hung it to be lit from the left, perhaps among other works of art which like this one reward prolonged, attentive looking. 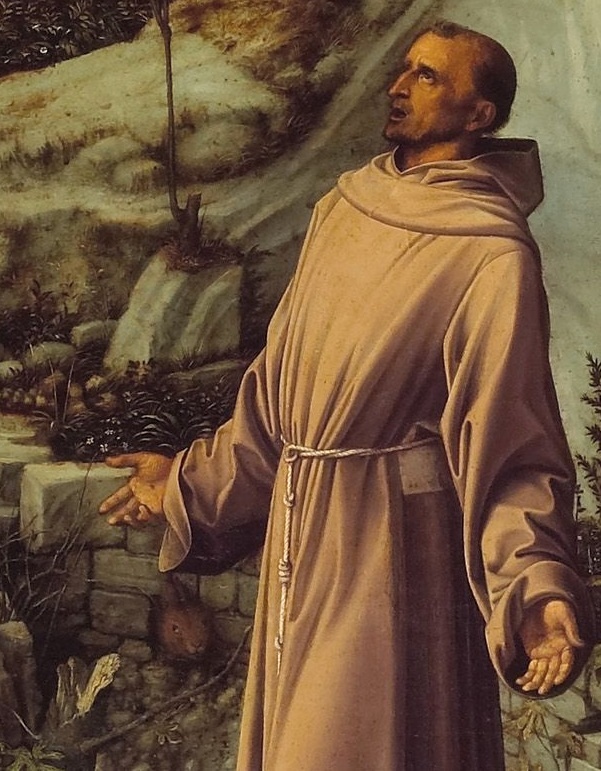 For more on this remarkable painting, see In a New Light: Giovanni Bellini’s St. Francis in the Desert (New York: The Frick Collection, 2015), including the excellent essay, “St. 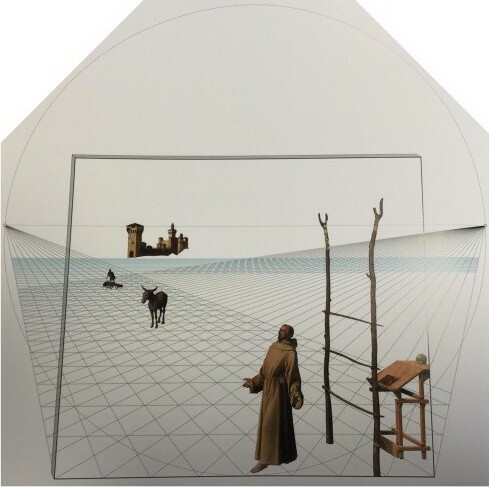 Francis in the Desert and the Art of Linear Perspective,” by Joseph Godla and Denise Allen, from which the above diagram comes. Giovanni Bellini (c. 1435–1516), born into a distinguished Venetian artistic family, left a remarkable artistic heritage in his own work and in his influence on other masters. His father Jacobo Bellini (1396-1470) taught not only Giovanni and his brother Gentile Bellini (1429-1507), but also Andrea Mantegna (1431-1506), who married their sister. Despite traveling little outside the Veneto, Giovanni absorbed the lessons of Northern Renaissance artists and other Italian painters and theorists, creating many works of peerless serenity and harmony in color, composition and the treatment of light. His students included some of the greatest painters of Renaissance Italy, including Titian (c. 1485-1576), Sebastiano del Piombo (c. 1485-1547) and the short-lived Giorgione (1478-1510). In the 1480s he began employing a large workshop of apprentices to leverage his consummate craftsmanship. This panel, immediately preceding the expansion of his practice, by contrast appears to be entirely from his own hand – indeed, Bellini’s fingerprints are still visible on portions of the painting he touched before the oil dried, as if to leave another signature.